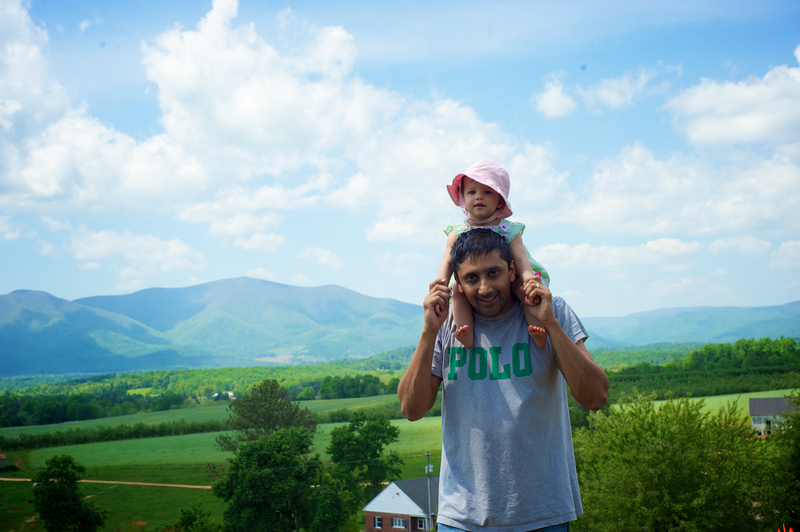 Our family went strawberry picking for Mother’s Day at Seamans’ Orchard, a location we love in part because of the amazing view of the Blue Ridge Mountains. It’s a beautiful way to spend an afternoon together; we try to go every season, and we always stop for ice cream on the way home. I love making these memories with my kids, and I look forward to seeing seeing pictures of us there, especially as the kids change so much from year to year. Mama and Hannah at Seamans’ Orchard. Can’t wait to see how she grows in this photo over the years! Daddy and Hannah at Seamans’ Orchard. Apparently this is her strawberry picking outfit; I dressed her in the same thing, head to toe, for our outing today! 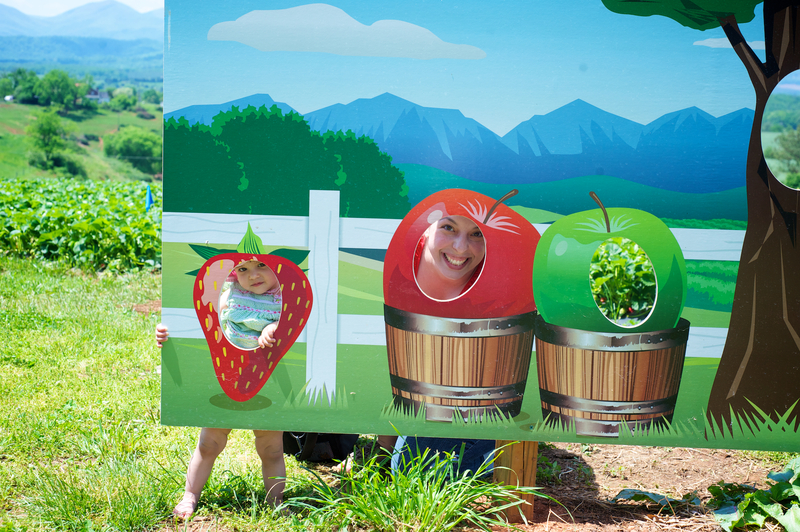 When I heard that The Motherhood Collective, one of my favorite organizations for local mamas, was going strawberry picking at Yoders’ Farm today, I was really excited (even if we hadn’t quite finished our haul from the last trip). Because of work, I tend to miss most of the Motherhood Collective’s Monday morning meetings, and I’ve made a priority to go to their new working mama groups on Saturdays as well as any other Monday groups when I have a day off. I really love taking part in the group; while we come from all walks of life, together we’re a beautiful community of mothers who support each other. And I’m slowly but surely developing some friends in the group, even if we don’t see much of each other outside of the “official” meetings between parenting and work schedules. And the outing couldn’t have gone better — I’m not exaggerating when I say it was absolutely perfect! We filled our baskets with juicy strawberries under the hot morning sun, then gathered in the welcome shade for a picnic lunch. My kids loved the goats, chickens and cows that were our lunchtime neighbors, and I had a great time getting to know some new mamas. 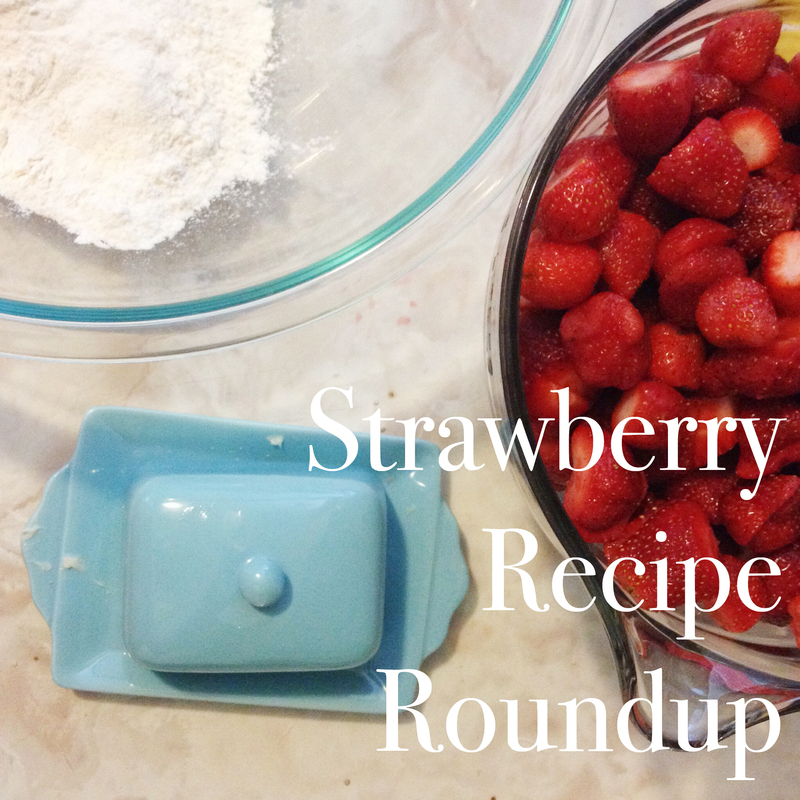 Let’s be honest: I’m loving the fact that we have more plump strawberries to snack on. Plus, I get to enjoy some of my favorite recipes again! I thought I’d do a quick roundup of some of them, with a few notes about my adaptations. The classics: I occasionally do strawberry shortcake. If I have time, I also have done hand pies, but I find that a regular-sized strawberry pie will do the trick if I’m craving a good pastry crust and juicy strawberry filling (a favorite recipe is below), and frankly goes a bit faster. There’s always freezer jam, but we don’t eat a lot of jam in our house so I usually go for other uses. Over the past few years, most of the following recipes have made it into regular rotation (I’m including one I haven’t actually made yet, but you’ll see why!). Strawberry pie with orange zest, from Saveur. This is simple and delicious. If you don’t have vanilla beans, substitute a teaspoon of vanilla extract. I’ve also swapped the orange zest for lime zest for a more summery pie. Omit the orange juice and/or zest all together if you like, but it’s a really nice touch. I’ve got dough chilling in the fridge for tomorrow night, and will likely assemble this pie. Smitten Kitchen’s strawberry summer cake. Many of Deb’s recipes get tested at Casa Khan within a couple of days of its original post…they’re so.very.good! This one is no exception, and I don’t usually make any substitutions here. This is what I made today for dinner at a friend’s house. If you’re able to bake it so it comes out of the oven just before dinner, I highly recommend it. It’s divine warm, and be forewarned: this begs for a dollop of homemade whipped cream (it becomes a sort of jumbled shortcake that way). No link here, but a simple favorite of mine when I’m hosting a dinner party: strawberry and fresh mint dessert topping. Slice about a quart of strawberries. Take about 10 fresh mint leaves and muddle them with a tablespoon of sugar, either with a mortar and pestle if you have one, or use the back of a spoon in a wide, sturdy bowl (if you do it this way, it will be helpful to chop the mint to help release the oils). Stir the strawberries and mint sugar together. That’s it! This topping is really delicious served over a scoop of vanilla ice cream over a warm brownie. Last but not least, Strawberries Romanoff, another simple but delicious use for fresh strawberries. I tried a variation of this treat recently at Cao during the Pastiche at Main girls night out. It was scrumptious, and if you prefer not to use alcohol, you could easily substitute a tiny bit of orange zest or flavoring, or forgo flavoring altogether. At Cao, they served this with dark chocolate shavings. Yum! Tonight’s rendition of Smitten Kitchen’s strawberry summer cake, the perfect end to our cookout. Note: I have not been paid to endorse or link to any of the above sites, just sharing the love for some favorite local folks and of course linking to my favorite recipes!